I want, I think, to keep that? It’s my basket. I can keep what I want. The above was written in a twelve-minute fastwrite from a prompt developed by one of my classmates at Amherst Writers & Artist’s Workshop Leader training in Chicago this September. Along with my fellow students, I delved into the AWA method, which you can read more about here. I was drawn to the method, based on the work of Pat Schneider, because of her bedrock belief that every single one of us is born with creative genius, that EVERYONE is a writer/storyteller (regardless of educational level, age, or socio-economic status). Writing that moves us, inspires us, makes us feel, makes us laugh, makes us cry—such writing is the result of connecting to our deepest voices. Our true selves. I already knew this to be true—that everyone has within them a unique and creative voice. I learned it from the skilled leaders and community at Cincinnati’s Women Writing for (a) Change, where I found my voice (which I had all but lost) in core classes, workshops, and retreats. This summer it became clear to me that what I most wanted is to learn ways to unlock that magic for others. All kinds of others. People who aspire to write books, people who have written many books, people who want to write poems, people who don’t think anyone wants to hear their stories, people who think no one is listening, or that no one cares. The act of expression—genuine, authentic expression—is an act of liberation. For me, it is transcendent. Writing is when I connect to my soul-self. At AWA training, my classmates and I learned about taking creative risks, about creating an environment that welcomes the seeds of new ideas and allows craft to bloom. It was a transformational week. I’m happy to say I’m a certified AWA Workshop Leader now! Tonight I led my first small-but-mighty AWA-method workshop at Clifton Cultural Arts Center. I think I will put tonight in my basket, and keep that, too. Never lose hope, my heart, miracles dwell in the invisible. more beautiful than the curve of a femur or a rib or your smile? 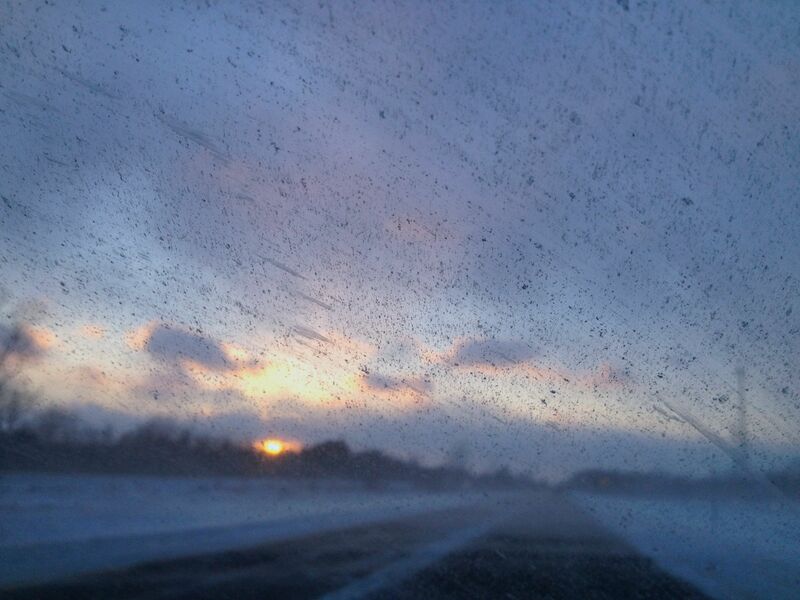 this sunset through driving snow.